The Spider Solitaire Free(Patience) by Happy Sky is the #1 fun cardgames. Spider Solitaire Free is a famous & classic solitairecard game. The Spider Solitaire Card Games Free has a fantasticuser interface, beautiful graphics and subtle sound effects. Drag,tap, or for the most fun, give cards a shove to send them on theirway! SPIDER SOLITAIRE GAMEPLAY The main purpose of the spidersolitaire free card game is to remove all cards from the table,assembling them in the tableau before removing them. Initially, 54cards are dealt to the tableau in ten piles, face down except forthe top cards. The tableau piles build down by rank, and in-suitsequences can be moved together. The 50 remaining cards can bedealt to the tableau ten at a time when none of the piles areempty. SPIDER SOLITAIRE FEATURES ★ 3 SpiderVariations--1-suit,2-suit,4-suit(traditional) ★ Custom backdrops& cards from your photos ★ Subtle sound effects ★ Drag and dropcards or throw them! ★ Landscape & portrait orientation locksetting ★ Fantastic and beautiful user interface ★ A variety ofcard animation effects ★ Unlimited Undo ★ Show/Hide the moves &time status bar ★ Detailed Spider Solitaire card game rules andstandard scoring ★ Detailed Statistics so you always know yourrecord ★ Detailed dynamic hints so you can overcome obstacles Wehope you will enjoy the Spider Solitaire Free,Your support will beour greatest motivation! We would like to hear your feedback.Please let us know what you think of spider solitaire free and rateus after each update. Spider Solitaire Free is one of the mostpopular solitaire card games free on android. Spider Solitaire Freehas been the classic solitaire card games free for users in digitalage. This Spider Solitaire Free is a outstanding implementation ofthe solitaire card games free for all. Although countless cardgames can be found on Android world, this spider solitaire freecard games will not disappoint you for sure. Spider Solitaire Freeis the most popular solitaire card games free included in Windowscomputers all over the world. Now we bring the fun challenge toAndroid, with this new Spider Solitaire FREE card game. 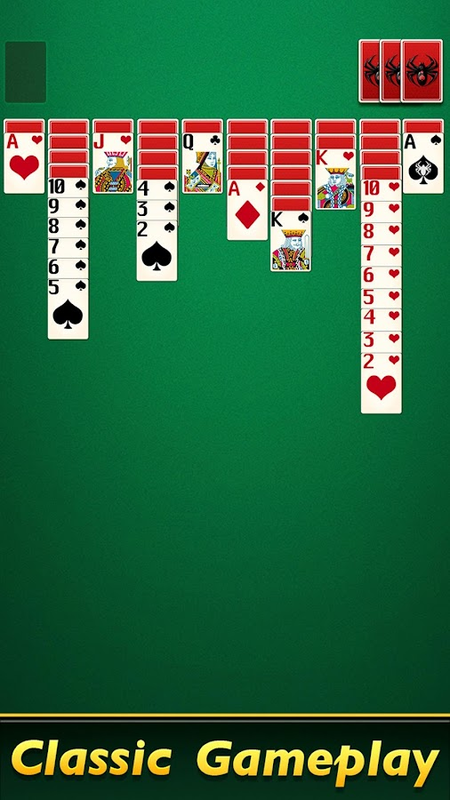 If you liketo play solitaire card games free, which require skill, strategyand a lot of patience, then this spider solitaire free is the bestsolitaire card games free for you. Farm your way to Solitaire rewards In the funnest TripeaksSolitaire card game around - Play Solitaire - Grand Harvest! If youlove classic Klondike, Pyramid, FreeCell, or Spider solitairegames, you’re going to love the Tri-peaks solitaire experience ofSolitaire – Grand Harvest. ♠ Join the fun - get farming andcard-flipping as both your crops and your coins grow as you playfun tripeaks solitaire card games! ♥ Clear each levels on everyfield as you flip your cards and harvest your crops. It’s fun, it'sFREE - and the most rewarding free tripeaks solitaire game you’veever played! This isn't one of your standard tripeaks solitairegames - this is Solitaire - Grand Harvest tripeaks! Fun REWARDS& Exciting Tripeaks Solitaire Games! Enjoy all of theexcitement that tripeaks solitaire games have to offer, with FREEsolitaire bonuses HOURLY - harvest your crops every hour for evenmore tripeaks solitaire rewards! ♣ Get flipping, harvesting, andjoin exciting tripeaks solitaire missions and challenged for evenMORE free solitaire rewards and bonuses! ♦ Level up your solitairegame - clear your cards and receive rewards as you harvest eachfarm and field! The better your card flip, the better the tripeakssolitaire game rewards! Need for more awesome solitaire bonuses?SPIN the BONUS WHEEL for extra tripeaks solitaire bonuses includingFREE coins, EXTRA cards, FREE solitaire rounds and EXTRA harvests!In a tight spot? Use your coins for WILD cards - got a long cardstreak you don't want to break? Use a WILD card and play any cardin its place! Get SOCIAL and Get REWARDED! Tripeaks solitaire gamesare even more fun with friends! ♠ Get 10,000 FREE COINS when youinvite your friends to play their own tripeaks farming solitairegames - send them a link or Facebook invite to have them join thetripeaks farming fun - then watch them make their way around theirown farms, or send them some solitaire cards! ♥ Go VIP: Harvest,farm, and card flip your way to VIP tripeaks solitaire levels andearn exciting rewards - but be warned, you’ll need to harvest andthink strategically! Download and Play Solitaire - Grand HarvestNOW! Your crops and cards are waiting for your harvest, and thesetripeaks solitaire games won't play themselves! Swing by the farm,flip your cards, and download one of the most exciting solitairegames of all: play Solitaire - Grand Harvest tripeaks now! Spider Solitaire is one of most popular Solitaire card games in theworld. the game rules of Spider Solitaire are very similar toclassic Solitaire game. On top of the original gameplay of SpiderSolitaire, we added tons of new features into the game includingcustomizable themes. We believe with these features, you will enjoySpider Solitaire in a completely new way. The cards and backgroundsare carefully designed for people of all ages. If you are a fan ofSolitaire games on PC, you’ll surely love this free Solitaire game!Game play: Play with two decks of 52 cards each. Depending ondifficulty, the deck consists of one, two or four different suits.Try to collect them with fewest moves possible! Game highlights: ♠Classic Spider Solitaire gameplay ♠ Addictive and challenging ♠Optimized for mobile phone play ♠ Beautiful and customizable themesMain Game Features: ♠ Clean and user-friendly designs ♠ Big andeasy to see cards ♠ Single tap or drag&drop to move cards ♠Customizable beautiful themes ♠ Auto-save game in play ♠ Feature toUndo moves ♠ Feature to use Hints ♠ Timer mode supported ♠Left-handed supported ♠ Landscape mode supported ♠ Up to 10 toprecords ♠ Offline play and no data cost ♠ Multiple languagessupported If you like playing Spider Solitaire on PC or otherSolitaire card games, you should try this one! This is one of ourtop rated Solitaire games! Download Now for Free!